If you follow me on Twitter or are a Fan on Facebook, you may remember that I gave away a mini-Anytime session, to take place in Culver City, to one lucky fan/follower! Well that lucky winner was Elena!! I was so pleased Elena won because she is the sweetest person you could ever hope to meet, and this session gave us the chance to get to know each other better! When I asked her what type of session she wanted to do, she said enthusiastically “an engagement type session!” Except she and her handsome and equally sweet husband have been married for eleven years! Yep Eleven years! And they have three beautiful sons together! But they never had a chance to do an engagement session…so eleven years later it was about time! 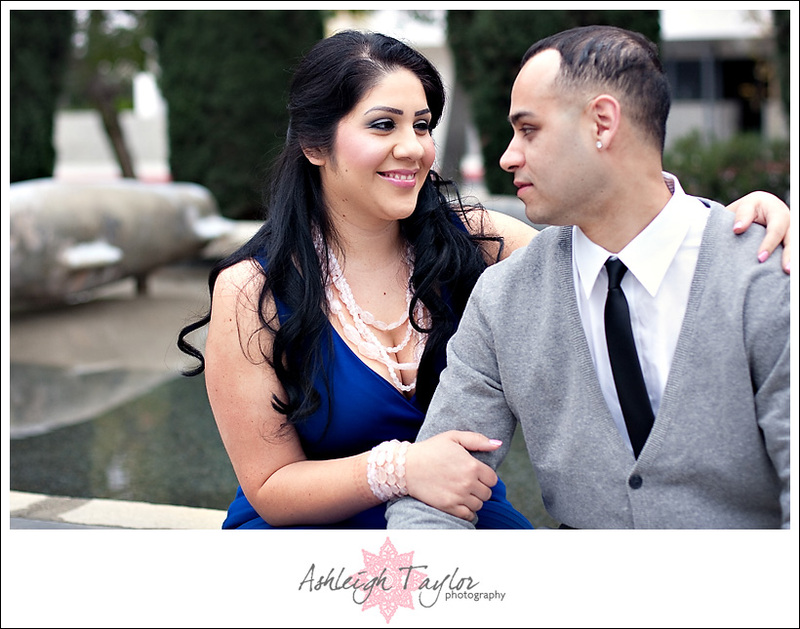 We met in Downtown Culver City which is one of my favorite places to shoot. It’s always low key while still feeling urban, has great backdrops every where you look, and is a pretty unique spot as not everyone shoots here! Yep Culver City is kinda a hidden gem! And I LOVE that about it. 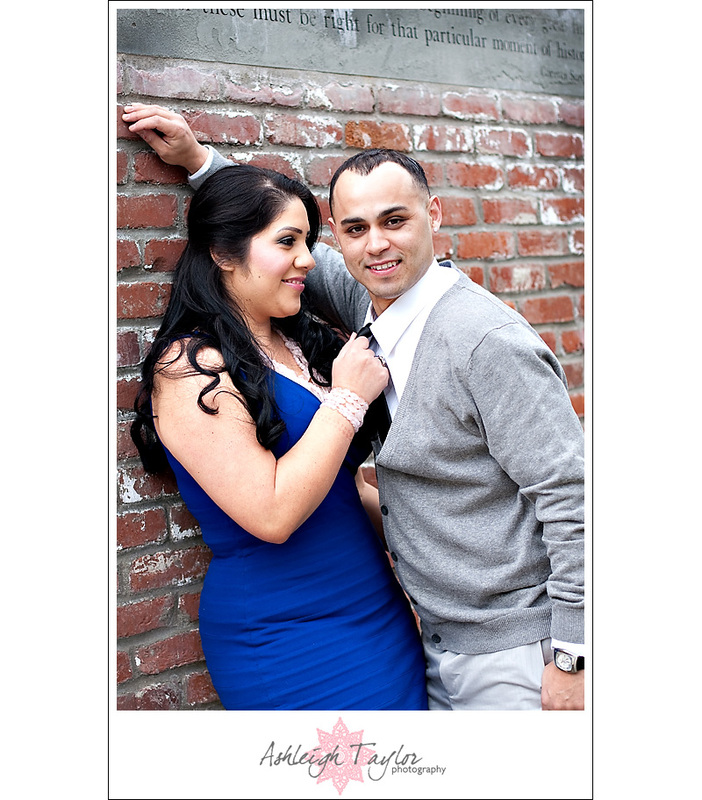 The thing I loved most about this session was that Elena & Memo had the passion of a newly engaged couple! They were so giddy, they couldn’t take their eyes off each other. Clearly these two are meant for each other and are doing something right! I also love their fierce and fabulous style! They worked the camera so well, it was like they were professional models! And Elena, if you didn’t know, is a very talented make up artist so of course her make up for the session was impeccable! She just looked stunning! 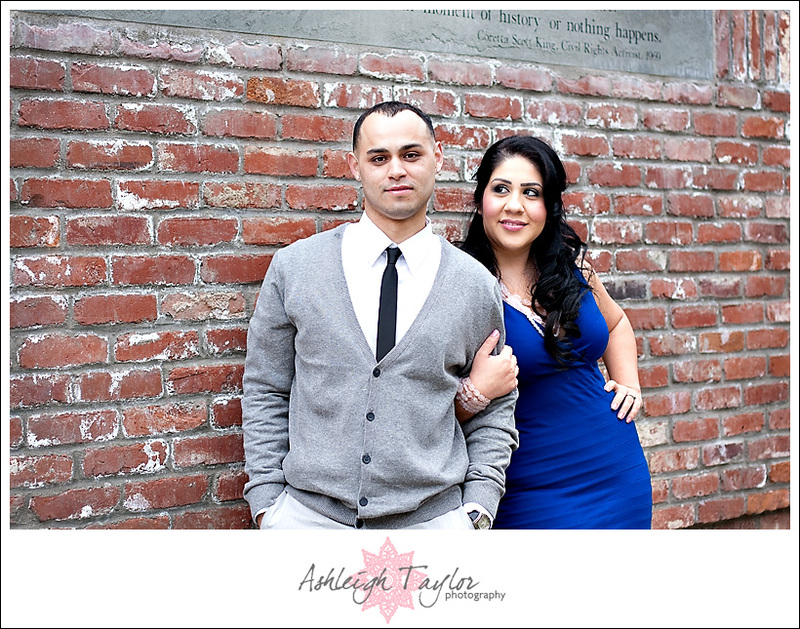 Culver City has never seen a hotter couple, I am sure!! I love the way Elena’s blue dress just POPS in every single picture! Ladies, this is why I tell you to wear “jewel tones, jewel tones, jewel tones” for our sessions! I love the way you two look at each other! I really do! Its just…sizzle! Elena & Memo thanks for being so awesome! I had a blast with you two and am so glad you won! For a few more images from this session check out the SLIDESHOW below! And readers remember, if you become a fan on Facebook or follow me on Twitter, you too could win an anytime session! I’m planning to give one away soon, so what are you waiting for? -brittany- - Elena looks gorgeous! You did a fabulous job Ashleigh! Sean - Pretty beautifully dressed couple, it must be said! I love the second last for some reason, and there’s certainly a spark to them you’ve captured. Really sharp set! Elena - We had so much fun with you Ashleigh! Thank you so much! We can’t wait to hang some of these in our home!